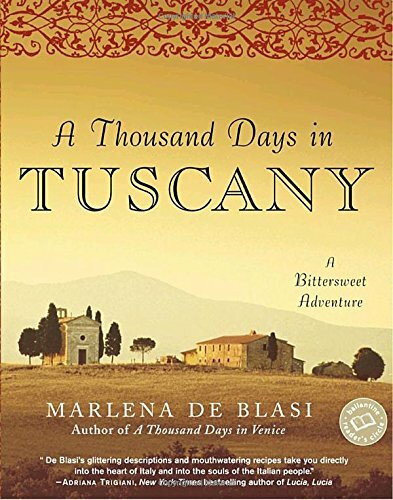 My latest read is A Thousand Days in Tuscany, a memoir y Marlena de Blasi. This is the follow-up book to her earlier memoir, A Thousand Days in Venice. Both books do a terrific job of re-creating the sights and sounds (and tastes) of Italy. I so have to go back there.... Until I can manage that, I'll just have to read about it. Here is my teaser, from page 236. "It's the second weekend of December and every little village and borgo is celebrating their own newly pressed oil. Bonfires in village squares, great wood-fired grills set up on which to roast bread and sausages, whole pigs gilding on spits, makeshift burners to heat red wine, accordion players, mandolin duets, mangiafuochi, fire-eaters, giocolieri, jesters in medieval dress, tarot readers in satin skirts come to say the future and bishops in silk robes come to bless the oil and the souls it will nourish."